One of the first images we see in director James Mangold’s remake of Delmer Daves’s 1957 western (based on a Dime Western Magazine story by Elmore Leonard) is the barn of hard-working, honest, civil war veteran turned cattle rancher Dan Evans being burned down as revenge for his overwhelming debts that he opted not to pay in order to care for his land and feed his wife and two sons. While his older son William (Logan Lerman) looks at his father Dan (Christian Bale) as though he were a coward, Dan tries to show him that it pays to be on the right side of the law. This lesson is made all the more difficult after he and his sons stumble upon the aftermath of robbery of a Pinkerton guarded stagecoach by infamous outlaw Ben Wade (Russell Crowe) and after Wade spends too much time in town with a beautiful barmaid, is apprehended by officers and Dan who happens to be in the right place at the right time, depending on how one views it. Although given a limp after part of his leg was blown off fighting for the north, Bale’s Dan volunteers himself as the best shot in his regiment to help the small group of men (including a crusty Peter Fonda, a reluctant vet Alan Tyduk, and the lawman Dallas Roberts among others) assembling to assist in bringing Wade to the 3:10 train to Yuma, Arizona jail for two hundred dollars. Desperate enough for the money to face not only Wade’s gang of outlaws that trail closely behind him but travel through violent Apache territory and ruthless railroad bosses turf (including Luke Wilson in a small cameo), Dan is shocked when his son William comes along for the ride partly to help his father and partly because he is fascinated by the outlaw Wade who continually manipulates his captors and seems to be the one in control despite his being restrained. Indeed, Mangold, whose work includes such diversity such as Girl, Interrupted, CopLand, Identity and Walk the Line, seems to pay particular attention to his actors and delights in making character driven pieces that thrive on dramatic interplay between human beings rather than just hitting certain plot points to get to the next set-up in America’s oldest genre. 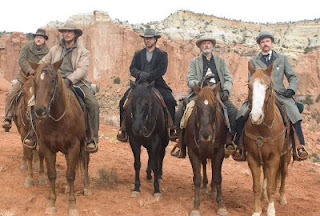 In fact, as again reported by Lengel, Mangold stated that he aimed to liven up the genre with a timelier feel adding, “… I wanted a little sense of the long shadow of the corporate America to come… is this last of a breed of outlaws really bad [Wade’s gang], or is what’s coming worse?” Although it does have some striking similarities in both theme and script to the iconic anti-western about duty over sense, High Noon (which was in itself an allegory of the McCarthy era), Mangold’s film stands out as one of the finest westerns in years and definitely the best American film released this summer and one that if there’s any justice, will earn the continuously overlooked Christian Bale (the unanimous first choice by Mangold, producing partner wife Cathy Konrad and Russell Crowe) an Oscar nomination for his subtle, internalized and quietly powerful portrayal that was so believable one felt as though we were actually witnessing his thought processes at times. Beautifully photographed by the son of John Casssavettes's art director, also named Phedon Papamichael (cinematographer on The Pursuit of Happyness, Walk the Line, and Sideways), the film was also punctuated by a tense score from Scream trilogy composer Marco Beltrami and inventive editing from Michael McCusker that helped make some of the more gasp-inducing sequences including the Pinkerton robbery at the start and the lengthy final gun battle at the end so amazing to behold.